There is little denying that the Burnout series is one of the fastest and most addictive racing experiences on the market. While with Acclaim, Criterion provided a glimpse of the greatness that were to come in the future. Now with EA, and I'm sure a substantial budget increase, the Burnout series has become legendary. From the consoles to the PSP, there is little lost in translation in Burnout Legends. Taking the series award winning speed, action, attitude and using tracks from Burnout, Burnout 2, and Burnout 3, gaming on the go has never been so much fun. If there is a downfall to the title on a whole is that gamers who are currently playing Burnout Revenge may have to re-adjust to not being able to bully cars off the road from behind because in Burnout Legends any car collision is a crash. Otherwise, there is little to complain about in Burnout Legends and tons to praise. The gameplay, like in any good Burnout game, is flawless. You would think that a game that moves so fast and has so much crash potential would be frustrating and sloppy. For some reason that logic never has taken form with the Burnout series and Burnout Legends, even on a smaller scale, plays just as well as its big brothers. You have all the speed, all the crashes and all the modes including - Crash, Pursuit, Burning Lap, Road Rage, Eliminator, Race, Time attack, Legends Face Off and Legends GP. You even have wireless Multiplayer action for up to four players in Race, Crash, Pursuit and Road Rage modes. Want more? How about an all new championship structure, a progression system that offers frequent rewards keeping gamers coming back for quick bursts on the go. But that's not all, you even have unlockable surprises in Burnout Legends, such as 25 unlockable cars, 5 of which you receive randomly depending on your specific copy of Burnout, with the other 20 unlocked by hooking up with friends via WiFi and playing challenges. Visually Burnout Legends is impressive. You have everything that Burnout 3 had visually, just at a smaller scale. This includes car reflections, wall scraping, ridiculous speeds, awesome frame rate and metal bending crashes that are only exceeded by the replay cameras offered. The redesigned tracks from the previous Burnout titles are great to race on again even if you have played the prior games to death. The car models also impress, even if they are not licensed by auto manufactures. 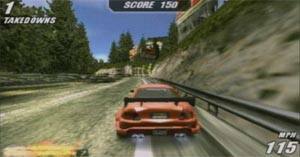 The presentation of Burnout Legends is also great, giving gamers the old school map track selector which was my favourite in Burnout 3. Choosing your next destination is a little wonky in Burnout Revenge, so I was happy to see the Burnout 3 way of choosing your route back in full effect. Overall, you will only be disappointed slightly if you are expecting something completely new, otherwise this is Burnout at its core and at its best. Audio in Burnout Legends is exactly what you would expect from this series, nothing more, and nothing less. You have car crushing crash effects, high revving engine sounds, and your typical love it or hate it EA Trax music which we simply adore. 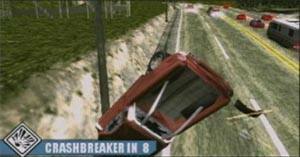 Some of the sound effects from Burnout Revenge even make it into the game such as the cheering crowds after a massive crash. In conclusion, Burnout Legends is easily going to be one of the defining car games for the PSP that contains extraordinary graphics, brilliant gameplay and the same addictive nature that was found on the XBox and PlayStation. A must have for all PSP owners.